Currently we offer 2 installation options depending on your location within the UK. M&S Kitchens Certified Installation Teams are installers who work for us either as employees or sub-contractors used on a regular basis. We are able to give a direct price for installation in these areas. We are forever increasing the number of skilled teams who install for us so the orange area above will grow in size. 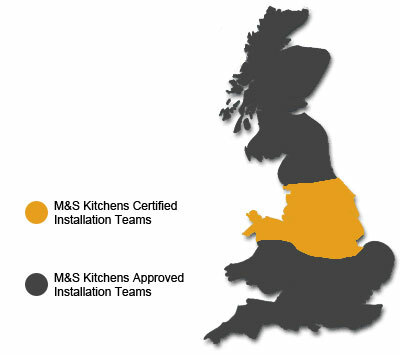 M&S Kitchens Approved Installation Teams are teams which we will recommend to carry out your installation. They will either have carried out installations in the past but do so infrequently or will have passed a careful vetting process where we check references from customers and employees. When the trust with these teams builds up through frequent use and positive feedback we will add them to our Certified team list. We have a selection of Premium Quality granite worktops available with full installation and precision cut outs made from our CNC machines. Our trusted installation teams are dedicated to install your kitchen from start to finish.